The words “Arnold Schwarzenegger zombie movie” create certain expectations. Maggie, the glum new indie that technically fits that description, meets almost none of them. For starters, where are the zombies? Though set in a world where a virus has turned a portion of the population into flesh-eating fiends, the film features only a few rotting stragglers. When the ghouls do shamble into frame, moaning for their next meal, it’s Arnold, naturally, who sends them falling out of it. But he does so not with a glib one-liner but a heavy heart, during scenes too short, simple, and somber to be called set pieces. This Arnold—bearded, weary, finally looking and acting his age—regards his trusty shotgun with dread. He spends most of his screen-time praying he’ll somehow not have to use it. Schwarzenegger, in what may well be his most downbeat performance ever, stars as Wade, a father in a funk. The man has good reason to despair. It’s the aftermath of one of those cataclysmic zombie outbreaks George Romero helped turn into big-screen tradition. Though the military appears to be succeeding in its efforts to contain the pandemic, contagion is still a daily danger. The latest victim: Maggie (Abigail Breslin, quite good under increasingly elaborate makeup), the oldest of Wade’s three children, whose gnarly, festering bite mark might as well be a triage symbol. Because the virus takes a couple weeks to run its course, Wade is allowed to bring his teenage daughter home to their dramatically underlit Midwest farmhouse. Once she begins to “turn,” he’ll be faced with two unappealing options: send her to the quarantine zone, where she’ll live out her final hours among a horde of fellow infected; or handle the matter himself. 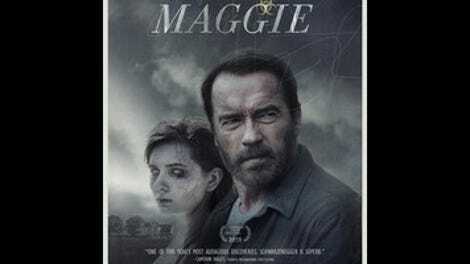 Maggie, in other words, takes a staple of living-dead cinema—the passage when everyone wrings their hands about a loved one who’s been bitten—and expands it to feature length. As countless college term papers can attest, zombie movies are often about more than just zombies. This one doesn’t disappoint on that front, using the basic genre framework to explore what it’s like to live with a terminal illness and to confront the imminent death of a child. (Suggested alternate title: The Fault In Our Scars.) There’s no suspense about whether Maggie will make it; her fate is sealed in the opening scene. And rarely does the film attempt to be conventionally scary, though some of it does qualify as body horror: Breslin’s doomed heroine at one point fishes a couple of squirming nightcrawlers out of her wound, as a thick film begins to grow over her eyes and a web of dark veins advances across her back. As for Schwarzenegger, he for once convinces as an ordinary American, despite his typically oversized frame and undisguisable accent. (The flannel shirts help.) Maggie uses the man’s advancing years and his limitations as an actor to its advantage. The movie doesn’t ask him to speak much, instead drawing power from images of him walking through barren fields at dusk or staring sullenly into a raging bonfire. There’s a strange poignancy in seeing this action hero put in such a helpless position; for all his size and strength, there’s nothing Wade can do to protect his daughter. Maggie plays, in a way, like Schwarzenegger’s Million Dollar Baby. Set aside the monster stuff, and it’s basically the story of a macho icon asked to commit an act of unbearable but merciful violence. He knows now why we cry, and it’s something he can do. So why doesn’t the film feel like a new classic of the genre? Maybe because Wade and Maggie, for all the effort the actors expend portraying them, aren’t really characters. We learn almost nothing about them beyond their immediate crisis, and there’s little sense of shared history between them, which makes it hard to know what this family is on the brink of losing. In place of complicated relationships, Maggie goes heavy on melancholy, rendered through the various shades of its muted color palette. The film’s first-time director, Henry Hobson, cut his teeth helming title sequences—most pertinently, for AMC’s hit series The Walking Dead and Naughty Dog’s acclaimed survival horror game The Last Of Us. The latter seems especially worth mentioning here, as it presented both an intricately designed post-apocalyptic world and a richly developed father/daughter bond, all while bombarding players with some truly crackerjack action. Maggie possesses none of those qualities; it mainly gets by on novelty—the way it refuses to conform to whatever mental image a basic log-line might conjure. Somehow, though, it’s hard to shake the feeling that the expected version of an “Arnold Schwarzenegger zombie movie” might have actually been more satisfying than the unexpected version we got.